We have a good thread on Cyrodiil armors, why not discuss weapons too? I know there are a ton of TR-created weapons in the P:C data (and I personally think they're kinda outdated), but I was thinking we could add our own ones, especially doing some expansion on the Imperial set. Could use more weapon types, such as Imperial Mace, Imperial Dagger and Imperial Spear. Ornate weapons with golden hilts, fitting for high-ranking Legion officers. For use together with Bronze Armor set. Nibenay-style. Some low-quality weapons made of natural materials/junk. Clubs, darts, axes, maces. Goblin axe we already have. 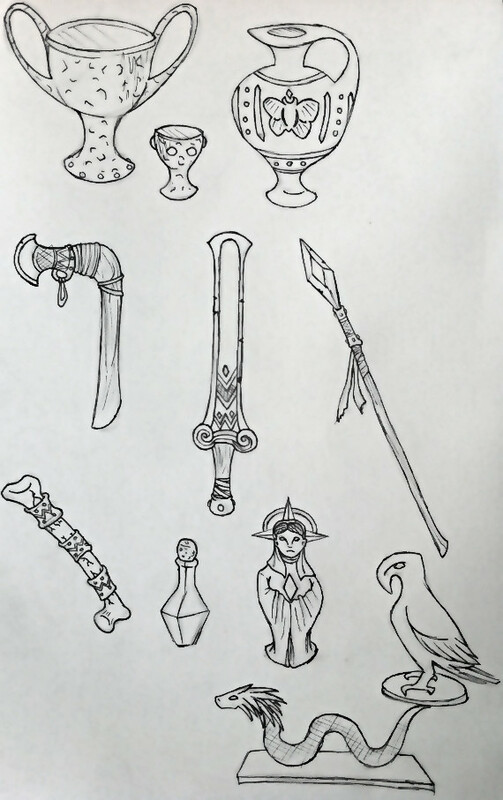 Weapons that were used by Cyrodiils of Alessian age, found in ancient tombs. Original Akaviri weapons, not the Tamriel-made knockoffs. 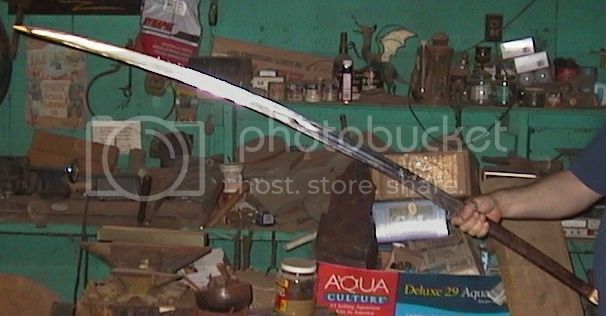 Katanas, daikatanas, tantos etc, owned by nobles and found in Reman age tombs. Used by Tsaesci. Last edited by R-Zero on Sun Apr 24, 2016 7:24 pm, edited 1 time in total. Long popular in the West, the mass-produced, one-handed, double-edged heavy broadsword commonly used by the Legions is descended from the original elaborate, decorated Breton broadsword designs. The Nordic broadsword developed independently, and is a more plain, practical weapon. All broadswords are commonly used with sword-and-shield techniques, the Bretons favoring the heavy tower shield, while the legions prefer a smaller standard-sized shield. The club is usually a crude, improvised one-handed blunt weapon common among less technologically sophisticated cultures like the Argonians, but it also a cheap and effective militia weapon used with a light shield in Cyrodiil and the Western provinces. The Dwemer crossbow is an ingenious device that permits someone with only modest training and skill to fire a missile bolt massive enough to penetrate heavy armor. The Imperial Legion's mass-produced version is somewhat less effective, and most Imperial missile troops and hunters use the more popular short and long bows. These exotic two-handed, single-edged long blades of Akaviri design are neither common nor popular for military or private use. They are superb examples of weaponcraft, but expensive and subtle in technique. For centuries, cheap and serviceable iron and iron-reinforced weapons have been produced in quantity for the Legions. These and similarly made iron weapons are in use throughout the Empire. Elegant and efficient, the Akaviri katana is too expensive and sophisticated a weapon to be popular with the Legions or hero-adventurers, but well-heeled nobles, collectors, and swordmasters prize the blade for its superior balance and effectiveness. The longsword is the standard officer's weapon in the Legions, and a noble's weapon in the West. The mace is a favored weapon of the Western knight, combined with a standard shield. The sabre is the weapon of Imperial light cavalry. Since horses cannot adapt to Vvardenfell's harsh climate, sabers are uncommon, except among Legion veterans. In the West, the wooden short bow is the standard weapon of Legionary missile troops and scouts. Cheap iron and steel shortswords are standard issue for Legion troopers. The Imperial shortsword is a superior Legion guardsman's weapon. Retired Legion smiths settling in Morrowind have popularized Imperial shortswords with the growing Dunmer merchant class and with Hlaalu nobles and their retainers. The staff is the standard informal weapon of the traveler, doubling as walking stick and utility tools. Battlemages, spellsword, nightblades, and other magical support troops in the Legions also train with the staff, among other blunt weapons. Imperial steel weapons are standard issue for the elite units of the Legions. Nobles, merchant-traders, and professional mercenaries prefer the higher quality materials and craftsmanship of Imperial steel. Various other weapons of exotic design (in particular, the tantos and katanas made in the Akaviri style) are also made of high-quality steel. Heavy two-handed hammers were developed in the West to counter the defensive protection of the heavily armored Western knight. I'll admit, I somehow see this as a very low-priority topic, purely for the fact that we are not really in shortage of choices, when it comes to weapons. Clothes and armors (or creatures for that matter) are a different thing. But it's good to have this background information gathered here and maybe one feels motivated to implement it later. worsas wrote: I'll admit, I somehow see this as a very low-priority topic, purely for the fact that we are not really in shortage of choices, when it comes to weapons. Clothes and armors (or creatures for that matter) are a different thing. True, Morrowind has a relatively big number of weapons suitable for use in Cyrodiil. Still, I think it would be nice to have the new weapons done sooner, so we won't have to revisit the locations/NPCs later to add them. I could potentially tackle some of the weapons after I'm done with most of the jewelry (the Colovian half, at least), unless you guys would prefer to have me working on something more pressing. I'm not that good with complex stuff that requires rigging though. Well, yet. But in any case, at least some brainstorming won't hurt. The only thing that I would think will be relevant anytime soon is minotaur weapons. I like your ideas on the subject. I think it is definitely worthwhile to conceptualize First- and Second Era Imperial weapons, and perhaps some unique artifacts for the Colovian area. 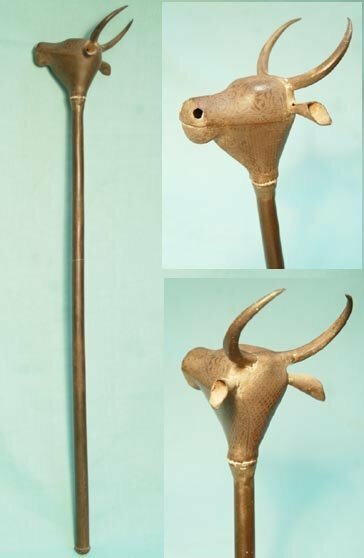 In terms of unique region-appropriate weapons, I would like to see fishing spears used in the Nibenay. There I think the safest bet would be to go full weaboo and draw inspiration mainly from Japanese weapons. Vanilla Morrowind katanas/wakizashis/etc. look very simplified and are straight, perhaps 2E ones could have more pronounced curves. Here are some Japanese sword shapes from different time periods, for reference. and perhaps some unique artifacts for the Colovian area. This can be a very interesting topic. First idea that came in my head was the spear of Bendu Olo, enchanted with Cure Common Disease and Dispel on strike and used by him in the cleansing of Thras. Can this come in handy for the Strident Coast? We actually have a harpoon in our common data files already, but yours looks a bit better. Maybe make yours fit into the same space? Then we could use it as replacement. worsas wrote: We actually have a harpoon in our common data files already, but yours looks a bit better. Maybe make yours fit into the same space? Then we could use it as replacement. Is the harpoon you're talking about the SHotN variant? It looks a tad too long and thin. Are there any harpoons using this model placed in Cyrodiil already? Perhaps we could use two distinct variants - Nords and Cyrods are most likely hunting different beasts, after all. We could add your harpoon as a second variant, I guess. T_Com_Var_Harpoon_02 and let interior/exterior creators decide what they prefer.